Deal Book. 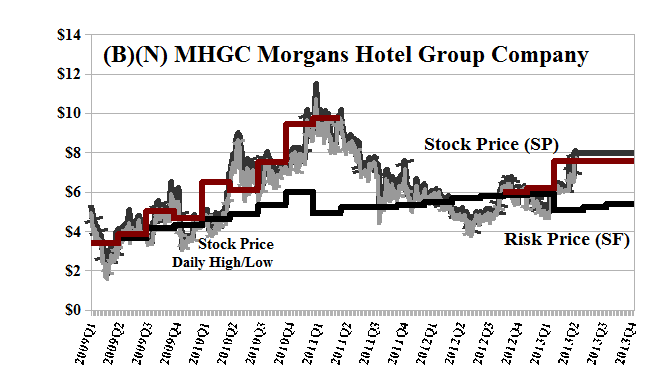 The Morgans Hotel Group is under pressure to produce a profit (Reuters, June 13, 2013, Morgans Hotel board gains upper hand ahead of proxy vote). Annual revenues have steadily declined from $315 million in 2008 to the current $190 million and the losses are between ($60 million) and ($100 million) each year. The company doesn’t pay a dividend and the key executives are earning $1 million to $2 million a year, and have a nice place to stay wherever they go, but with over 5,000 employees it’s more than just a family hotel. How hard can it be to turn a profit when money is not (really) an issue and the guests hope to pay for a lot more than just a nice place to stay in Boston, New York, London (England), Marrakech (Morocco), and a half-dozen other places in the U.S.A.? We think (just our opinion) that they ought to compete only with themselves for excellence, and not the much (ten-fold) larger Marriott International. However, the battle for control has been going on for some time and the stock price is now up to $8 per share from $5 to $6 three months ago, and $4 early last year. Please see Exhibit 1 below. There are a number of institutional holders of 5% to 10% of the stock who are staying gratis and enjoying the price ride, but the main agitation is coming from investor Michael Olshan and Alfred Taubman’s OTK Associates LLC which seems to have accumulated a position of about 14% of the stock since 2008 when the stock price collapsed from $15 to $20 to end the year at $4 (Bloomberg, March 5, 2008, Morgans Gains After Billionaire Taubman Buys Shares). The market value, even at $8, is only $250 million, and what that buys is $600 million in assets,$750 million in debt, and a negative shareholders equity of ($150 million); the fixed assets are booked at $230 million (net) with an accumulated depreciation of $180 million. Companies such as PSA Public Storage (Nasdaq 100) are doing way better than that and have a current dividend yield in excess of 3%. The price of risk is $5.50 and so values the company at $180 million but, we suppose, the selling group/takeover group thinks that they can get a lot more, maybe over time by running the hotel their way, or by selling or developing the properties. Our estimate of the downside volatility in the stock price is minus ($2) per share so that it could be trading between the current $8 and $6 or $10 without surprise. But these are surprising times, and we’d think about the July put at $7.50 for $0.60 per share as an appropriate shelter for the upcoming board meeting on June 14th, tomorrow. Morgans Hotel Group Company operates, owns, acquires, develops and redevelops boutique hotels, primarily in gateway cities and select resort markets in the United States, Europe and other international locations, and nightclubs, restaurants. From The Company: At Morgans Hotel Group, we are the global leader and innovator of the lifestyle hospitality sector, dedicated to building a differentiated brand portfolio and establishing our properties in 24 hour urban and select resort markets. We create a vibe that encourages our guests, who we call the Creative Class, to live every moment more intensely. Morgans Hotel Group is immersive, transformative and deeply engaging; embracing irony and style, elegance and luxury, with strong and daring vision. We bring together the creative power of many – designers, artists, musicians – to bend the rules, stretch the realm of possibility and constantly push the boundaries of what a hotel can be. We lead, where others follow. The company was incorporated in 2005, has 5,000 employees, and is based in New York, New York.